The Los Angeles Flower market is a great resource for flowers and related supplies. I absolutely adore going and being surrounded by thousands of flowers in every color imaginable. I wanted to share some tips on visiting the flower market because I think you’ll love visiting it too! I always try to find street parking, but usually can’t find any. My “go-to” parking lot is on the corner of Wall St. and 7th Street for approx $6 all day. There are cheaper lots in the surrounding areas, but this one is extremely convenient. If you are getting anything more than a few bunches, I find it is a hassle to walk back and forth from your car if it is parked too far away. Arrive early. I recommend getting there in the first 2 hours because the best flowers go fast! Not to mention, many shop owners pack up well before the stated ending times. Bring cash. If you aren’t buying a large quantity of flowers, some owners only accept cash. Take a walk before you buy. Take a quick walk around all the stalls and “survey” what everyone has. This way you can compare what every shop has in stock and make sure you are getting the freshest flowers available. Pre-order. If you are getting a large quantity of flowers in a specific type or color, pre-order your flowers 3 weeks in advance (just to be safe). If you are ordering a flower that is out of season, the grower will have to fly them in and they usually need extra time for that. Note: The growers will require a deposit to pre-order, but they usually let you do it on credit card. The flower market was an amazing resource for me while I planned my wedding. I went to the flower market about a year before my wedding to see which flowers were “in season” during my wedding month. I went from stall to stall and took pictures of all the flowers that I really liked and then used the pictures as a starting point for which flowers I wanted to use for my wedding. Throughout the process, I found a flower that I never knew existed! They sound like a Harry Potter spell but I absolutely love them! These “ranunculus” were only $3.75 a bunch! And they are in season RIGHT NOW! My favorite flowers in my favorite color. 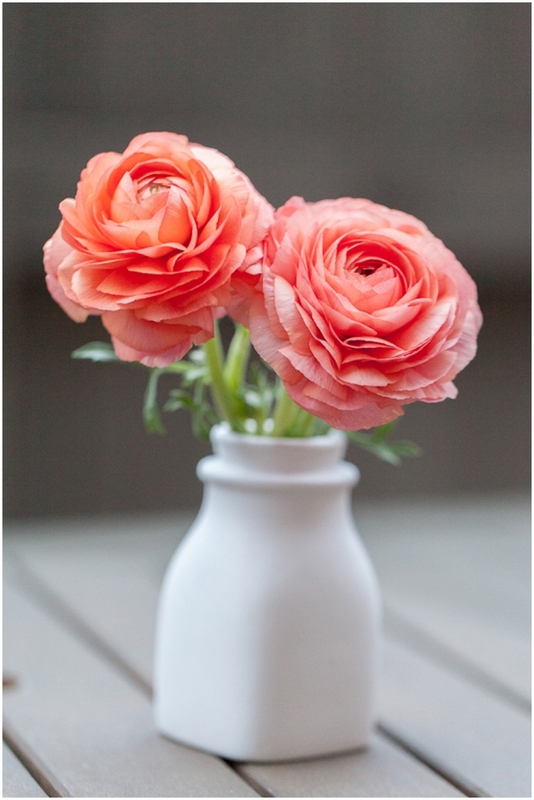 The picture on the left shows less than 2 bunches of ranunculus. I didn’t use a traditional florist for my wedding, but if I had, I would have shown them the images of my favorite flowers to give them a better idea of what I wanted. If you don’t know the name of a particular flower, you can always ask the shop owner at the flower market or ask your wedding florist when you talk to them. Your florist will also tell you which flowers are good for which kinds of arrangements and which flowers hold up well in the heat (if your event is outdoors). If you aren’t planning a wedding, the flower market is a wonderful place to visit if you are having a party or if you just want some flowers ” because”. Seriously, if you are having a bad day, the flower market pretty much equals instant happiness. And if you aren’t in the LA area, most large cities have some something similar, so just look it up online!